Four years ago last Friday, the Birther 'movement' effectively began, as the web began demanding to see Obama's birth certificate. Four years ago today, it was published online. And yet today, Birthers continue to issue demands, and continue to claim that others have accepted Obama's birthplace on "blind faith." Of course, it's anything but blind faith. Over the past four years, Obama's birth has been thoroughly documented and verified and re-verified. Below is a collection of many, but still not all, of the documentary evidence supporting Obama's 1961 birth in Honolulu. The Birther meme following the Breitbart story has been that Obama claimed he was born in Kenya for 17 years. One of the ways of demonstrating this is false is to show examples of Obama's biography from during that time, either not claiming a foreign birth or explicitly stating that he was born in Hawaii. Particularly if they were biographies that he was more likely to see. 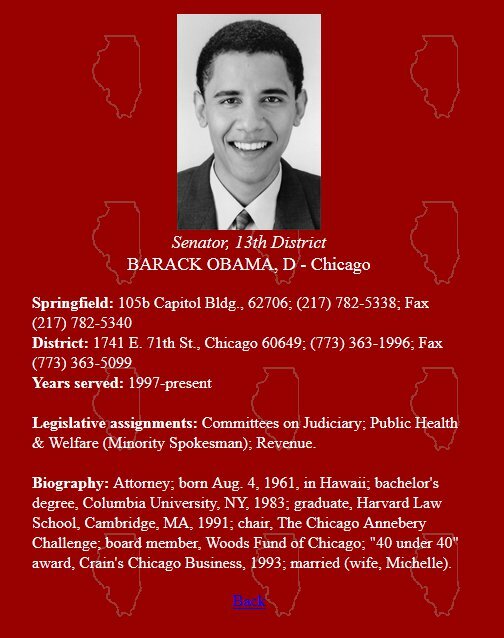 "Biography: Attorney; born Aug. 4, 1961, in Hawaii..."
Barack Obama in Crain's Chicago Business's 1993 "40 Under 40"
In the wake of Breitbart.com's promotion of a 1991 literary agency's biography of a young Barack Obama, there's been increased interest in some circles as to how the President represented himself prior to the start of his political career. And while so much has already been republished online in the last four years, from newspaper articles to videos of book panels, I found one that's been almost completely overlooked. Crain's Chicago Business publishes an annual "40 Under 40" list of young up-and-comers in the Windy City. And in its September 27, 1993 list, 33-year-old Barack Obama was among those honored. (As a soon-to-be 34-year-old, I suddenly feel like an underachiever.) This recognition has been noted in several of Obama's early biographical sketches, and was quoted from on the Fight the Smears website. But as far as I can tell, it's never been published online in its entirety. Last year, Barack Obama galvanized Chicago's political community as no seasoned politico had before. The director of Illinois Project Vote orchestrated an unwieldy band of 10 staff members and 700 volunteers to the tune of 150,000 new voters for the general election, the highest number registered in a single effort. "Under Barack's leadership, we had the most successful, cost-effective, and orderly registration drive I've ever been involved with," says Alderman Sam Burell of the West Side's 29th Ward. For Mr. Obama, an attorney and community organizer by profession, the job fit two of his aspirations: political reformer and entrepreneur for social justice. "Temperamentally, I'm more suited to the latter. Practically, it's very difficult." In fact, his catch phrase of late is "building institutions," although he's not yet sure what to build to achieve his most ambitious goal: to improve the quality of life for the working class and the poor. Meantime, the 1991 Harvard Law School grad works at David Miner Barnhill & Galland, a small firm that handles civil rights cases and community development projects. He also lectures at the University of Chicago Law School on issues of race and law - topics that evoke strong feelings for him. Born to a white American mother and a Kenyan father, Mr. Obama was raised in Hawaii and Indonesia and likes to impose his world view on racial issues. "I'm in a unique position," he explains. He's used to uniqueness. In 1990, his election as president of the Harvard Law Review broke the publication's color lines and made newspaper headlines. Rather than waltz the traditional path to a Supreme Court clerkship, however, he opted to direct Project Vote, write a book on race relations (to be published by Random House next year), and assist community groups in urban real estate development. "If you have the chance to go to Harvard Law School, it's no accomplishment to be (just) a partner in a law firm," he observes. "It is an accomplishment to make a difference."